Lucy Chase Williams is principal of Chase Consulting, providing public relations, publicity writing and web development services to entertainment, non-profit and small business clients. She is, in her own words, “a one-hit-wonder author.” Her book, The Complete Films of Vincent Price (Citadel Press, 1995), was reviewed by Hollywood Reporter as "an honest, often charming survey." She scripted episodes of A&E Biography (including “Vincent Price: The Versatile Villain”) as well as TruTV's Anatomy of Crime. Memberships include the SoCal Yale Alumni Association and The Academy of Magical Arts, Inc., the private club housed in the famous Magic Castle in the Hollywood Hills. JS: Our readers are likely to think of you as an authority on Vincent Price, who's nowhere to be found in the Thriller canon. What brings you to our neck of the woods? LCW: In the late ‘80s, I became friends with Laurel and Danny Benton, two of the children of Thriller’s associate producer Douglas Benton, so I got to know Doug, and talk shop with him occasionally, an amazing experience (gosh, would he have recorded some terrific commentaries!). He had some great photos from Thriller, including a jaw-dropping one of him with the ghouls from “The Incredible Doktor Markesan”. ("Papa Doug" passed away in 2000 so it's a heartbreaker that he couldn’t be a part of the project.) Sometime around 1995, my buddy, Tom Weaver, the world’s most prolific interviewer, found out I knew the Bentons, and after I introduced him, did a wonderful two-parter with Doug that ran in Fangoria magazine and then was printed in TW’s book, Monsters, Mutants and Heavenly Creatures. When Image began the complete Thriller set, Tom, who was already involved, had the genius idea for his interview to be recorded as a supplement, with Danny Benton “playing” his father, and Gary Gerani asking Tom’s questions. Danny is a horror filmmaker in his own right, and a huge fan of the show. PE: This is all very fascinating, but what does it have to do with how you became involved with the project? PE: Were there any particular episodes you wanted to do commentary on? LCW: At first, Gary suggested we do “Mr. George,” because he felt it was “probably the sweetest episode of the series” and one that he “definitely” wanted covered. He felt a woman’s perspective would add something “soft” I think he said to the mix. I know it was meant as a compliment, but... There’s obviously a dearth of women involved in genre fandom, for reasons waaay too complicated–and controversial–to get into here. But I would like to see the doors of the Old Dark “Boys Club” House opened... or crashed. I have to say, Gary and his partner on the project, Steve Mitchell, were very welcoming to me and treated me like one of the guys. I mean that in a good way. Anyway... I told Gary I’d like to provide a commentary to “The Prediction,” because I think at that point it was one of, maybe the only, Karloff episode not covered. JS: And that led to "Mr. George?" LCW: After that recording went well, he and Steve wanted to go back to “Mr. George.” An investigative reporter friend of mine was able to track down Gina Gillespie, who played the lead in that show, the little girl, Priscilla. Ms. Gillespie had had some unpleasant experiences with fandom in the past (stemming from her role as the young Blanche in the film, What Ever Happened to Baby Jane), and wasn’t comfortable coming forward to record her own comments–she left the business when she was about 15 and enjoys a very successful “civilian” career under her married name. But she was kind enough to give me an exclusive interview, which I transcribed and “performed” on the commentary, adding her first-hand recollections to the production background that I and Gary again provided. I think Ms. Gillespie’s memories were a terrific addition to the set. JS: Has she seen the DVD release? LCW: Not yet–I’m meeting her next week to give her a set. I’ll let you know what she says! PE: Can you give us a mike-side perspective on recording a commentary. LCW: It’s a heck of a lot harder than you think! Then you watch the (in this case) TV episode several times at home, timing out your remarks against the clock on your DVD player. Of course, when you get to the studio, you discover the playback either has NO timer, or one that starts at 1:47:16, in which case you are ****ed. So you’re in a small recording studio. A monitor, or large screen, runs the show in live time. Sometimes, you wear a headset (we didn’t for Thriller), sitting in front of a mike which has been placed either on a small table or on a boom. The sound guy (in another room) gets you to say a few words for a volume check, but that’s all you get. There’s no “rehearsal” or “mulligans.” The playback just starts. Remember to speak slowly, and clearly, and above all naturally, without any extraneous “um’s” or “uh’s.” Don’t breathe too loud, or sneeze, or make your chair creak or your jewelry clink. If you drink from the glass of water you strategically placed at your feet, don’t slurp. Make sure your papers don’t rattle. And know that no matter how desperately you want to start over, or take back something outstandingly moronic that just slipped out of your mouth, it’s generally going to be preserved for all time, because there’s rarely time and or money for retakes. Now, some experts prefer to be much less formal, and chattier, and even work without notes. I think of this as the “Wing The Thing” method, for which you have to be pretty damn confident. I’ll stick my neck out and admit this style doesn’t work for me, especially when there are more than two people speaking – too often, the end result gets muddled or even occasionally descends into a Marx Bros. kind of yuck-fest. This is a VERY personal opinion and probably will **** off a lot of people. 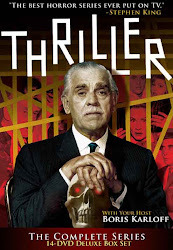 But I think the mix that producers Gary Gerani and Steve Mitchell got on this Thriller set – commentaries by pros, filmmakers, experts, actors, fans – is just terrific. That’s a personal opinion I hope a lot of people will agree with. JS: How far back do you and Thriller go? I don’t remember when I first caught up on Thriller – I think that Dan Benton might have actually loaned me some tapes. But between the legitimately-abused crime shows and some horror episodes that are too leisurely paced, it never really became a favorite of mine. IMHO, horror yarns have a lot more zing when they're told concisely, and you don’t have a chance to give too much thought to the far-out situations and characters' reactions to them. Many of the Thriller episodes could be cut down by 20, even 40 percent, and still work just fine. But Thriller definitely had atmosphere – being shot at Universal, “horror's cathedral” as it were, the best ones are just drenched in dark, cobwebby mood — sometimes so artfully done that it's hard to believe that each was completed in just a few days. LCW: Well, by the time I got involved, the “best” ones had been taken! I genuinely think that “Mr. George” is a lovely vignette, and I really felt I was making a contribution by getting Gina Gillespie involved. JS: And now for our standard questionnaire... what's your favorite Thriller? LCW: I guess I don’t have a particular episode favorite — but I enjoy all of Karloff’s intros. It just makes me smile, watching a wily old pro like that work it. LCW: If I had to answer... as I admitted in my commentary, I find Karloff's character in "The Prediction" very appealing, and enjoy watching him play that role as if he were really playing himself (or at least, the way all fans see him: warm, funny, charming.) Add that to the fact it was his historic first Thriller as a co-star, and I’d pick "The Prediction". LCW: In the horror episodes, I like the way the accent was on the macabre, as in "The Weird Tailor". It was cool that the scriptwriters adapted the type of stories found in Weird Tales magazine and writers like August Derleth. I enjoy the creepy appeal of the occult episodes, the sets and lighting, and some of the more-effective music scores. It’s obvious to say Jerry Goldsmith’s work (gosh, I owned so many of his soundtracks as a kid) is terrific. LCW: The lame crime episodes with their who-cares? characters and storylines and inappropriate jazz scores. LCW: It’s also such a waste that the show is a bit "monster-lite"; you'd think that the studio of Dracula, Frankenstein, The Wolf Man, The Mummy and so many others would have come through with more ghoulies for Thriller, beyond the occasional witch, or the "phony monster" like the ghost in "The Purple Room". Maybe the budget or the shooting schedules just didn’t permit monster-making — which can get expensive, when it's done well — on a regular basis. JS: Thanks Lucy! Be sure to listed to Lucy's commentaries on "The Prediction" and "Mr. George". What a treat to hear from Ms. Williams, whose book on Vincent Price was a big help when I was writing RICHARD MATHESON ON SCREEN (which is finally off press, by the way), and whose female perspective is all too sadly rare. I've often wondered if I could cut it as an audio commentator, and her remarks have certainly given me a greater appreciation of the challenges involved. Would love to know if Doug Benton had any interesting anecdotes involving Matheson's episodes of THRILLER ("The Return of Andrew Bentley") or THE GIRL FROM U.N.C.L.E. ("The Atlantis Affair"). A very interesting interview with Lucy Williams. I was especially interested in her thoughts on recording a commentary because over the years I've been disappointed so many times. Ten years ago I thought they were such a good idea and now I think most are a waste of time. The ones on THRILLER I'm happy to report are just about always of interest and enjoyable. I couldn't agree more, Walker. It seems as though each was handled in a different way. I was especially surprised (spoiler alert! )with Terror in Teakwood's commentary. Why? Well...you'll have to tune in tomorrow! It's OK; I'm man enough to take it. My T-Shirt can take it, too. Hi Lucy. Remember me; Mark Edward the magician? We spent a lovely couple of weeks drinking our way around Hollywood with Nick Courtney back in the 90's. Now thems was fun times huh? Great to hear you are involved with this project. I've been waiting for years. Mr. George rocks. I was very impressed with Ms. Williams's commentary on the DVD, especially with her preparation and presentation. Her comments on this blog made me think, too--this really is a boys' club, and perhaps I'll forego more commentary on the "babe of the week." It's easy to forget that this is not just a bunch of guys sitting around on basement sofas watching old TV shows.